Disappointment is a bitter, bitter feeling. It's kind of like a sinking ship, where your hopes are all buoyant and untouched, and it slowly but surely begins to slip under the surface of the sea. I remember reading Bethany Griffin's "Masque of the Red Death" a while back, and, while I didn't love it, it was still a decent enough read. 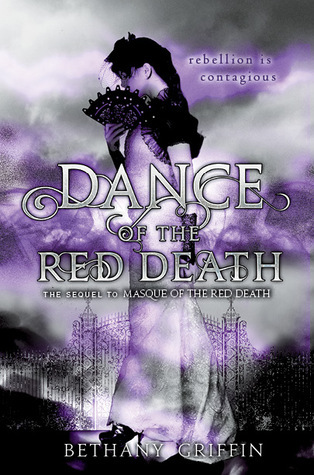 So when I found out that its sequel "Dance of the Red Death" was finally being released last week, I eagerly picked up a copy...and ended up feeling like maybe a plague couldn't be that bad after all. The life of comfort and wealth that seventeen-year-old Araby Worth has disappeared, replaced by a world of betrayal, death and disease. Now onboard a flying ship, Araby, along with the headstrong Elliot, her best friend April, and Will--the boy she loved but was betrayed by--seek to take revenge on Prospero, the cruel and twisted king who allowed the Red Death to spread amongst his people. Araby is determined to save the people she love, even if it means fighting until the very end and partaking in a dance of games in which no one can be trusted. "How could this be so dang boring?" was pretty much the only thought that crossed through my mind while I was reading "Dance of the Red Death". I think I ended up skimming the first twenty chapters, which sums up to about a good four-fifths of the entire book. What the heck happened? I remember finding the dark and grotesque atmosphere in "Masque of the Red Death" almost captivating, but none of that was really present in the sequel. Literally nothing happens in those twenty chapters. All I remember is some ship-sailing and occasional gun-shooting. The bulk of the book probably serves as some space-filler between the first book and the last four chapters, which was pretty much where the whole point of the book was. Those last few chapters were definitely exciting and twisted, and I feel like if Ms. Griffin had written the entire book based on those last few chapters, it would be way more exciting than it is now. This was just quite a snoozer. One of the other reasons I probably found "Dance of the Red Death" disappointing was the heroine. Araby is about as interesting as a piece of chalk. Sure, she's definitely a little more...alive in the sequel and has a little more backbone, but she's still such a passive, dull character. I couldn't really get into her mind and empathize with her, despite the fact that I could follow along with her thoughts and emotions, since, you know, you're forced to read about them in the first three-quarters of the entire novel. She's way too caught up in the same emotions of guilt and betrayal that she never really develops smoothly and realistically. And don't get me started on her little love triangle. She's kissing Elliot and Will like there's no tomorrow, without any sort of reflection in it. The fact that made it even worse was the fact that she knew she didn't even like Elliot, since he's twisted and just not the guy for her. My goodness. I think the saving grace of the novel was, as mentioned before, the last set of chapters, where Araby finally enters the palace and is forced to play Prospero's twisted game. There, the tantalizing darkness we saw in the first book really came to life, with corpses swinging from the ceiling and partygoers glazed in the oblivion of drugs and lust. That was when I really began to pay attention to what was happening and stopped skimming over everything. The tensions were undoubtedly high, and you really became invested in what was happening. It's just too bad that it only happened in the last four chapters of the entire novel. Overall, "Dance of the Red Death" really fell flat, with a dull heroine and an even duller storyline. Skimming over a chapter is bad enough; skimming over the first twenty chapters is just a definite no-no. Just thank goodness this series ends here--I probably wouldn't pick up the next book if there was one.